This dough is much easier to work with if you have a little plastic dough scraper like the one Peter is using. I got mine from King Arthur Flour (I have several, sheepish grin). It is also very helpful to use a scale to measure the flour. Combine everything except the olive oil in a mixing bowl or the bowl of a stand mixer. Mix for about one minute with the paddle attachment, or mix with a large spoon until the ingredients are well blended, about a minute. Add the olive oil, and mix for one minute more. Using a wet scraper, scrape the dough into a new lightly oiled bowl. Rest for 10 minutes. Scrape the dough onto a lightly oiled surface and stretch and fold it from all four "sides" as demonstrated in the video. Turn the dough over and shape it into a ball. Place the dough back into the bowl, cover with plastic wrap, and let it rest for 10 minutes. Repeat three more times, every ten minutes, for a total of four "stretch-and-folds." Place the dough back into the bowl, cover it with plastic, and refrigerate the dough. Three hours before baking, remove the dough from the refrigerator. It should have risen to about 1 1/2 times its size or more. After one hour, very gently transfer the dough to a floured work surface. Dust the dough and your hands with flour, and gently coax the dough into a 9 inch square. Using the dough scraper or a serrated knife, cut the dough into two even pieces. Fold the pieces in thirds, like folding a letter. Gently place the two loaves, seam side down, on a parchment lined and floured baking sheet. 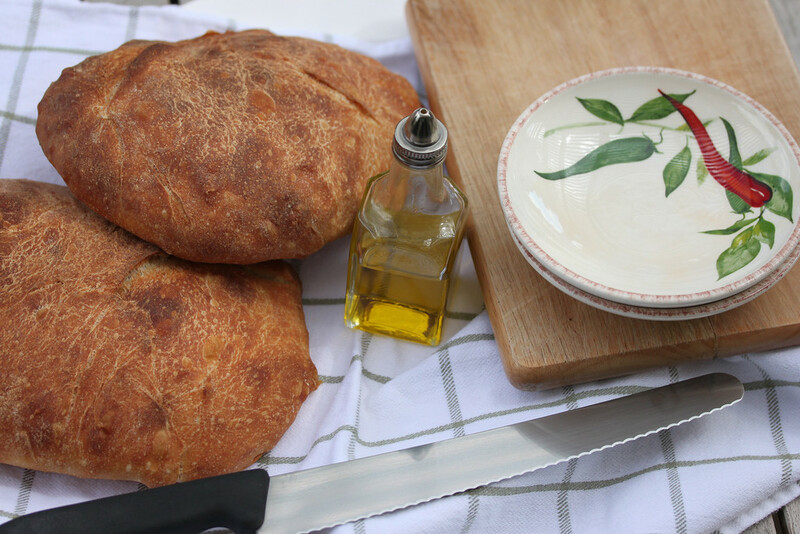 Spray the loaves with spray oil, cover loosely with plastic wrap, and let them rest for one hour. Gently flip the two loaves over, and, with floured hands (I use the dough scraper on the underside, and my other hand on top) gently stretch them to about a 7 inch long rectangle. Spray with spray oil, cover with plastic wrap, and let rest for one hour. Prepare your oven with a broiler pan on the bottom rack and a baking stone on the second lowest rack. If you don't have a stone, you can bake them on the baking sheet. Preheat the oven to 550 degrees F (or however high your oven will heat). After the dough has rested for one hour, boil one cup of water. Slide the parchment with the loaves onto the heated stone, pour the boiling water into the broiler pan (cover your oven window with a kitchen towel and be very careful not to spill or you might shatter it. I use a small, long handled saucepan and wear an oven mitt so I don't burn my forearm), and shut the oven door (don't forget to remove the kitchen towel). Reduce the temperature to 450 degrees F.
Bake for 12 minutes, rotate the loaves, and bake for another 15 to 20 minutes. The bread should be browned like the photographs, and register 195 to 205 degrees with an instant read thermometer. Allow the bread to cool on a cooling rack for about 45 minutes. 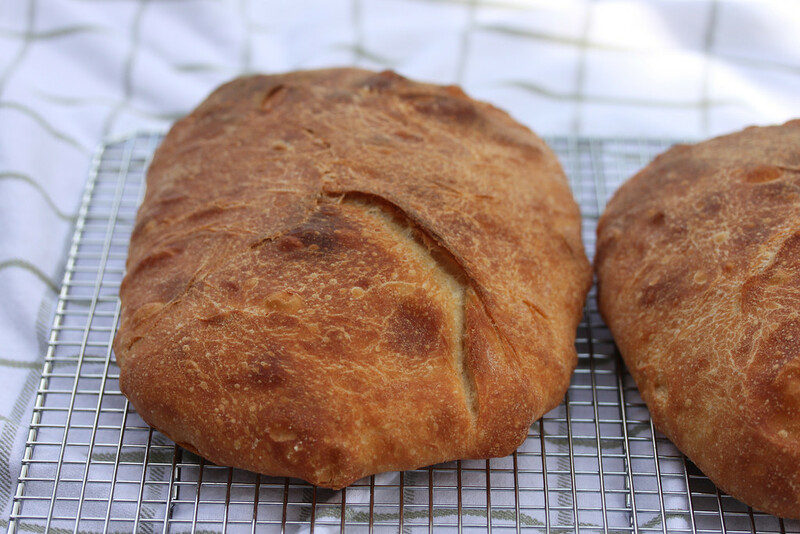 This recipe was adapted from Peter Reinhart's Artisan Breads Every Day. 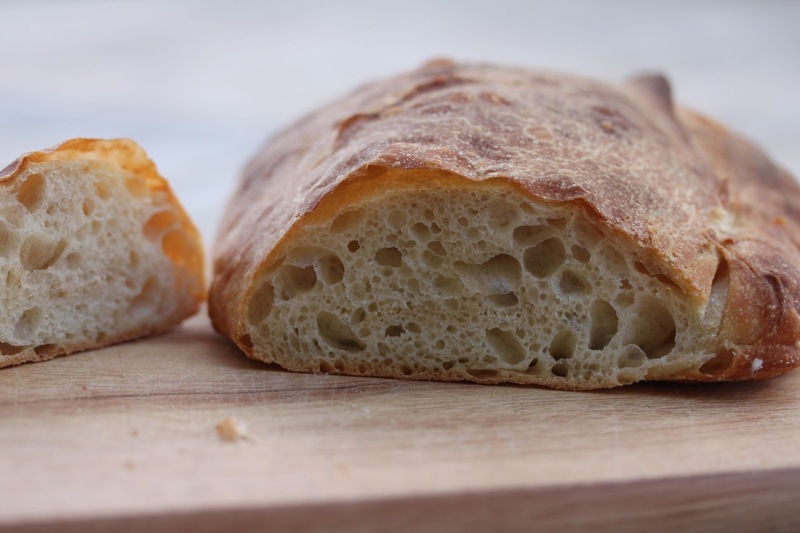 In the book, he describes many other uses for this dough, including baguettes and an amazing focaccia. If you want to try your hand at artisan bread, get this book. Every recipe I have tried has worked beautifully. Posted on Bake Your Own Bread. I have never, never, never gotten such nice air bubbles! Will for sure try this recipe one of these days. Got it bookmarked. Definitely try it. I had not either prior to trying this recipe. I was dancing around the loaf when I first cut it open. You should give it a try. May take you a few goes at it to get it right, but once you do you will will be amazed.